This is the fourth post in my series on the handling of narcotics cases in Peoria, Illinois. My last article discussed whether police may use drug sniffing dogs to conduct a search. A recent change by the U.S. Supreme Court has limited the circumstances under which law enforcement may utilize a canine in such cases. In this post I will discuss another important topic – defending against marijuana charges in our area. It is important to understand that, while opinions about pot are changing in our Country, possession of the drug remains illegal. If you have been arrested for a marijuana offense then it is important that you contact a criminal defense attorney immediately. Colorado, Washington, and other states have already legalized the possession of marijuana. Several other states are likely to do so in November of 2016. The fact of the matter, however, is that of this writing, possession of the drug remains illegal in Illinois. Possession of weed, depending on the amount and circumstances, can result in a defendant facing charges which range from a Class “C” misdemeanor to a high level felony for drug trafficking. If you have been arrested then it is a mistake to simply think that the prosecutors and the Court will simply see the case as “no big deal” and that you will simply explain the situation to them. Taking this incorrect approach can result in your accepting an unfavorable plea agreement or not fully exploring available defenses. This, in turn, can have a negative impact on your future (such as leaving you with a permanent criminal record). 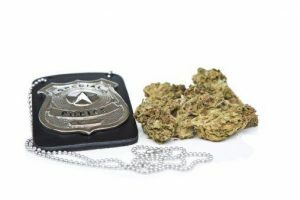 There are steps you can use to defend yourself if you have been arrested while in possession of marijuana. As I discussed in my article on search and seizure issues in narcotic cases, if it is shown that drugs were found due to police officers violating your rights then it may be possible to keep the marijuana out of Court If the marijuana is excluded from evidence then, quite often, the case will be dismissed; it is not possible for the prosecution to prove a drug case without drugs. Such a defense may be possible whether law enforcement found the marijuana through a search of your person, a search of your vehicle, or a search of your residence. It is important to understand that you have rights and that you should not consider yourself as facing an automatic conviction simply because you were arrested. An experienced lawyer can help you in such matters. I am a former prosecutor who substantially devotes his practice to defending the rights of the accused. I am familiar with the local legal system and I will know what to expect as your case moves forward. Contact my office immediately after being arrested so that I may assist in determining your options. In addition to Peoria I also service the cities of Bloomington, Decatur, Eureka, Galesburg, Morton, Normal, Pekin, Springfield, and Washington. My office also serves the counties of Fulton, Knox, LaSalle, Marshall, Mason, McLean, Putnam, Rock Island, Schuyler, Stark, Tazewell, and Woodford. Additional areas where we handle federal cases include Benton, Chicago, East St. Louis, Springfield, and Urbana.